We suggest you take a train/taxi from Glasgow or Prestwich airport to Ardrossan where we will meet at Lauriston Hotel at 10.00am. From here we depart for the 11.05am ferry to Arran. The voyage lasts about 1 hour 45 minutes. We disembark at Brodick and cross Arran cycling 22 miles to the west side of the island to Lochranza port. Visible from our view point positioned on a scenic peninsula is Lochranza Castle. This 13th Century hall house was converted into a tower house in the 1500s. From here we take another ferry to reach Claonaig on the Kintyre peninsula. Riding from Claonaig to Skipness Castle. Said to be haunted by The Green Lady, Skipton is another 13th Century fort, like Lochranza Castle, also built by the MacSween Clan. It’s main entrance was from the sea. Originally a modest house and chapel it fell to the Macdonalds who developed it into an imposing stronghold. The castle then passed to the Campbells in 1502 who completed the fortifications with a tower house. Once we’ve explored the castle we’ll cycle back to Claonaig and ride across the peninsula to Kennacraig and up to Tarbert over 14.6 miles. Tarbert is an idyllic Scottish village. We set off this morning cycling along West Loch Tarbert and then past Loch Stornoway to reach Kilberry. We continue along a coastal route with wonderful views across the water to Jura. Seals are often sighted in this area. 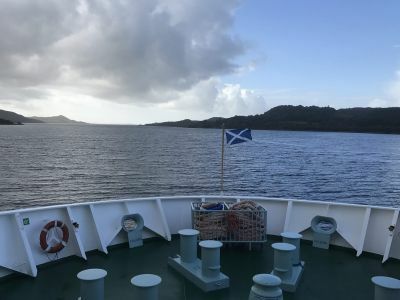 We then head inland on quiet road through beautiful wooded countryside to reach Ardrishaig and Lochgilphead enjoying views of Loch Fyne and Loch Gilp. We turn inland here cycling along the Crinan Canal from Lochgilphead to Cairnbaan. The route is quite level, and we ride through verdant countryside. We turn off the canal path and continue northward. Nearby is Kilmartin Glen which contains hundreds of cup and ring marked stones, chambered cairns and stone circles dating from Neolithic/Bronze Age times. Our accommodation for this evening is in charming restored cottages in the grounds of the luxury Kirnan House estate. There is even a hot tub where you can relax and revive tired cyclist’s legs. Kirnan is a haven for fishermen, ramblers and nature lovers. From Oban we begin the day taking a ferry across to Craignure on the Isle of Mull. Mull is the second largest of the Hebrides and an island of peninsulas which give it a long and varied coastline. 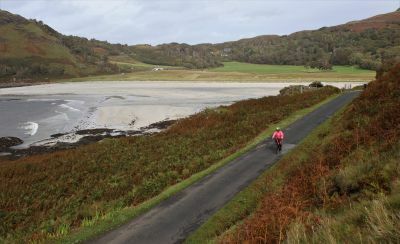 We follow the coast on single and double track road enjoying a scenery of clear blue loch waters and deep green fields to reach Salen and then ride on to Tobermory where we’ll catch a water taxi across the Sound of Mull to Drimnin Pier. From here we cycle 12 miles alongside the water to Lochaline. 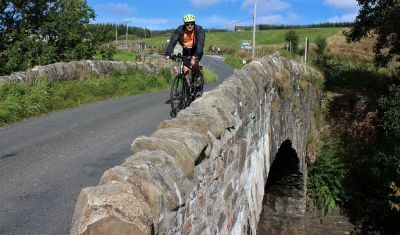 We ride through scenic landscapes enjoying views of Mull and passing sites of interest including the ruins of 17th Century Caisteal nan Con, built on the ruins of an Iron Age fort. 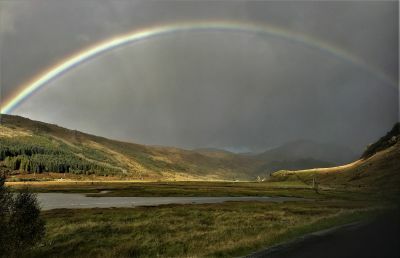 From Lochaline we turn inland to ride around Loch Aline to Ardtornish where we stay for 2 nights. A day to relax and enjoy your beautiful surroundings. There are options to walk, fish, kayak, dive. If you are keen for some more biking there are local paths, roads and forestry tracks. Rahoy Hills Nature Reserve run by the Scottish Wildlife Trust extends onto the estate; there are opportunities to see golden eagles, white tailed sea eagles, otters and pine martins. We set off today with an uphill ride through the country side and then downhill to beautiful Loch Linne. We follow single track road on the west side of the loch all the way to Fort William with a short ferry crossing to reach our destination. The dramatic waterside scenery is open until the last stretch through thicker enclosed woodland; a hunting ground for birds of prey. Several hectares of roadside woodland are managed by the Scottish Wildlife Trust as a reserve. From here we begin following the major natural fault line known as the Great Glen which divides Scotland from coast to coast. 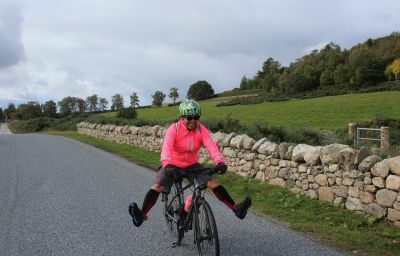 Riding from west to east, most of the route keeps to lower levels along a series of glens filled by lochs linked by the Caledonian Canal, harmonising human engineering and nature. Leaving Fort William, we pass the ruins of Inverlochy Castle, built in the 1200s, then cross the River Lochy to join the Caledonian Canal at Corpach. Following the canal towpath, at the start of our route we encounter Neptune's Staircase, a flight of eight canal locks built by Thomas Telford and the longest staircase lock in Britain. If we are lucky enough to be here on a sunny day you will enjoy spectacular views of Ben Nevis (the UK’s highest mountain) across the water. We cycle away from the canal for the last few miles to reach our accommodation for the night. 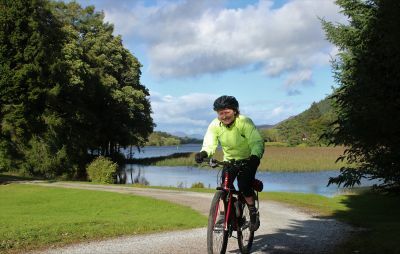 Cycling on, we skim the edge of Loch Arkaig, a very deep fresh water loch, riding through deeply wooded area of valley, flanked by walls and trees carpeted in thick moss; this area is known as "Mile Dorcha" or "Dark Mile". We pass by the spectacular Eas Chia-aig waterfalls that tumble down the north side of the valley. We continue following a waterside route along Loch Lochy. This is a relatively challenging stretch due to the variable surface and some gradient. Passing Laggan Locks we continue along Loch Oich on a fine gravel path on the east side. We re-join the canal towpath for our final stretch to Fort Augustus, a small busy town at the southern end of Loch Ness, built around the locks that lower the canal to the level of the loch. The village was named thus on the building of Fort Augustus, following the defeat of the 1715 Jacobite uprising, after the younger son of King George II, who was to become the notorious Butcher of Cumberland. Leaving Fort Augustus, we begin with some challenging uphill riding for around 5 miles to reach the Suidhe Viewpoint at 1200ft. From here there are amazing views of our spectacular natural surroundings. This is the more peaceful, less discovered side of Loch Ness with quiet minor roads and small communities. We enjoy a long downhill stretch through beautiful landscapes to Whitebridge. As we continue northwards we pass the smaller Loch Mhor and ride through the Lyne of Gorthleck. Legend has it that Bonnie Prince Charie stayed at Gorthleck House after the Battle of Culloden and had to flee after seeing loyalists outside, from an upstairs window. 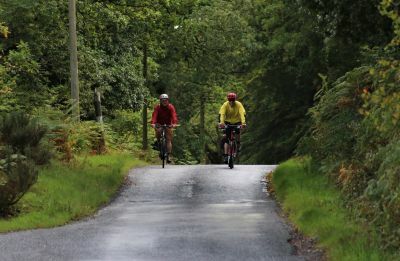 We continue to cycle quiet forested back roads all the way to Inverness, cultural capital of the Highlands and our destination! 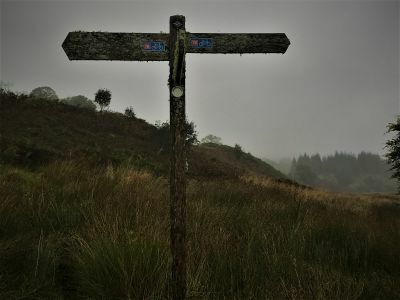 "Fabulous routes and scenery with quiet, many singletrack, roads. The weather was Scottish, with sun most days and rain most days - but nearly always with a wind behind! Mull..."